Although we sartorial enthusiasts aspire to style that lasts decades, not seasons, I think it's important to recognise the fashions we still follow. While we shun band T-shirts or 'ugly' trainers, we are still strongly influenced by our peers and those we see around us. Most tailoring enthusiasts today will tend towards a wider lapel than is seen on a high-street suit. It may be 9cm, it may be 8cm, but it will certainly be wider. They tell themselves it is more stylish. I tell myself the same thing. But of course there is nothing fundamentally better or more flattering about a wider lapel. Very skinny lapels are certainly silly, but so are overly large ones. The only thing that is consistently stylish and flattering is balance - not too far one way or the other. The same thing goes for the height of a lapel. A few years ago we seemed to reach peak lapel height, with collars shrinking and lapels flying off the back of shoulders. Today the most progressive suits seem to be dropping their lapels, with the gorge sitting somewhere mid-chest. There is a vintage influence here, and arguably it makes the chest seem larger. But fundamentally it is a fashion, and we should recognise it as such. The other obvious fashion is the width of trousers. Skinny trousers that cling to the leg are rarely flattering, but wide trousers can be taken to extremes too. The fashion today seems to be towards wider and higher styles. What other sartorial fashions are there? The most obvious are big waistbands and extended waistbands, and recently gurkha-style waistbands. Less obvious perhaps are deep turn-ups or cuffs, and three-roll-two jackets. There are also trends in shoes (double monks seem to have had their day); trends in shirt collars (longer and pointier) and of course shorter-lived fads for cloths (such as navy seersucker or tobacco linen). There’s nothing necessarily wrong with any of these. As I wrote back in 2008, I think you should be aware of your fashion cycle you're in - and enjoy it. But I would add that moderation is paramount. 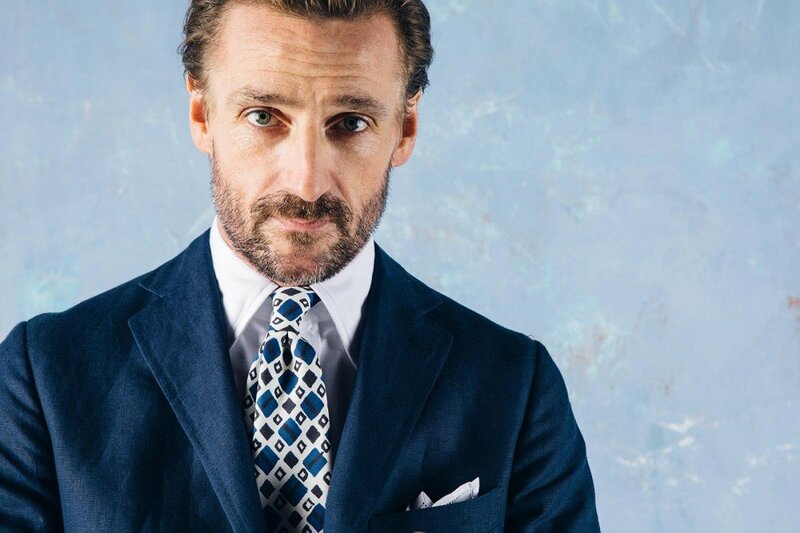 Savile Row tailors used to say that they followed trends in suits - just slowly. When the trend was for five-inch lapels in the seventies, theirs were 3 ¾. When it was two inches in the nineties, theirs were 3 ¼.
I think this is a good rule to follow, and we shouldn't pretend that we're not following our own, low-level trends. I have most of my non-English jackets made in a three-roll-two style. I also tend to have 5cm turn-ups and patch pockets. But I eschew gorge lines that are too high, and double breasteds that are taken to extremes. Don't pretend you don't follow fashions. Just be aware of it and enjoy it in moderation. As an aside, it is possible (and perhaps interesting) to break down these fashions into groups based on how long they last. There is the long-wave, generation-spanning menswear trend that has seen the lounge suit replace the frock coat and now, arguably, replace the dinner jacket. 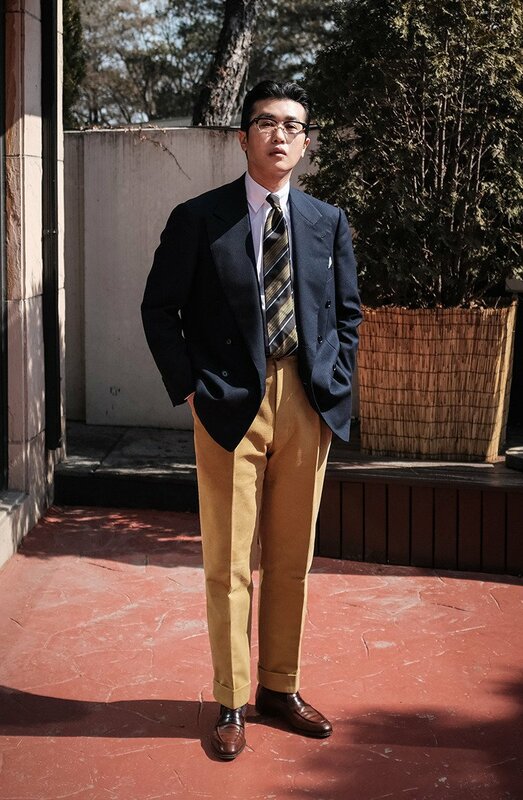 There are trends that last a decade or so, and tend to be seen in lapel widths, trouser widths and collar shapes (most of those mentioned above). And there are also fashions that last 2-3 years. The trends around cloths probably fall into this group, as do things like tie bars, or trouser pleats. US Esquire did a lovely piece in 2015 that used Google data to measure the popularity of various items of menswear, such as pocket squares (below). It was fascinating to see tie bars go up as fedoras went down. Of course, that piece is about mainstream trends, and we are not mainstream. Indeed, there is an argument that just as the internet makes trends more global, it also enables subcultures like classic menswear to carry on outside of the mainstream, as global websites and forums group a few hundred like-minded souls together to reassure each other. So perhaps we are setting our own fashions now. You can follow the discussion on The fashions of classic menswear by entering your email address in the box below. You will then receive an email every time a new comment is added. These will also contain a link to a page where you can stop the alerts, and remove all of your related data from the site. I’ve never understood why people say the lapel has to be x-width. My tailor said to me that the lapel width should be in proportion to the individuals chest size in order the achieve the right balance. This is a very interesting topic! The first comment reminds me of a previous one made by a reader few weeks ago who suggested exploring collars of shirts. If I can recall, his main concern was whether the choice we do make or should make in this area shouldn’t be anyhow related to our own bodies. Arguably, our bodies should be a prime parameter in the way we devise our style. And frankly, I think PS could properly explore this issue. What should be considered in this specific case? The face? The neck? The shoulders? Or rather all together? I think fashion waves are a pretty fundamental clash of interest between industry and consumers. Waves of higher frequency and amplitude benefit industry at the expense of consumers, and benefit low quality (producers and consumers) at the expense of high quality. The picture of the two guys in their wild trousers is a good example of sartorial style gone off the rails. Great site and reviews- thankyou. There is nothing about Goldings of St Albans on the site. A very respected tailor-(this i gather from the Bown’s picaresque reviews- have your ead those?) and one likely imbued with a lot of the older tricks of the trade: i’d be very interested in your take, and given you’ve managed to get up and down the length of italy! I’m guessing it is becasue it is too ‘traditional’ perhaps for your taste- but for that very reason i think it would be interesting.. any plans? The issue with covering other UK tailors is not that they’re too traditional, but that they don’t really offer anything different. Italy has genuine different traditions, styles and cuts around the country, all of which are interesting to cover. 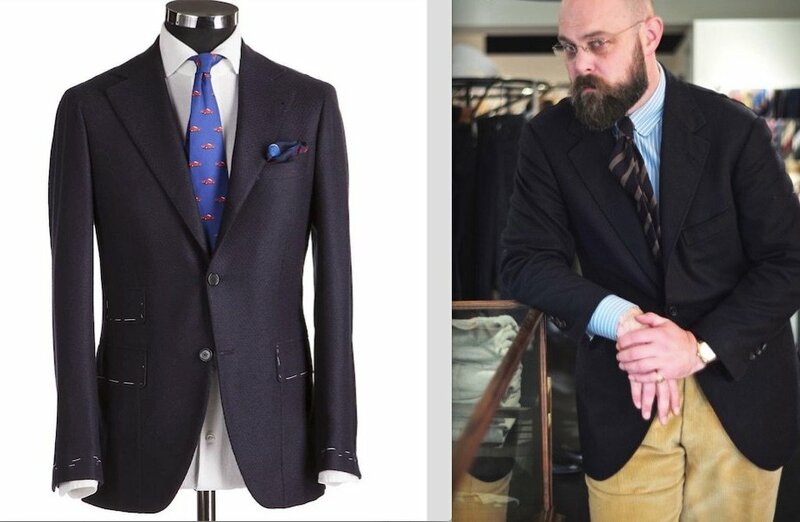 But UK tailors pretty much all derive from the London styles that you can already get in London – and in London at a range of prices, from Huntsman to Whitcomb & Shaftesbury. This is all very true. I find it quite funny to read on different online outlets where people who a few years ago said highwer rise and pleated trousers or longer jackets were old fashioned or just plan ugly are now hailing them as timeless and natural. We’re all fashion victims to some degree. There also appears to be a divergence between online trends and what people are actually wearing on the street (or at least on the streets I tend to walk down). 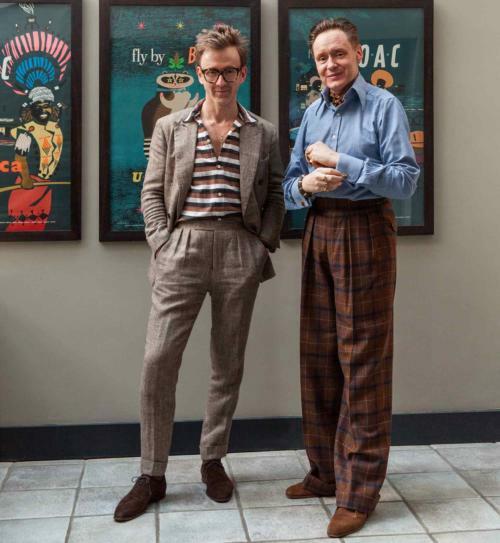 The wearing of separates is a great example of this; click on SF and you could be forgiven for thinking that no-one ever wears a two piece suit these days (let alone a three piece). However, I’ve yet to see more than 1-2 people actually sporting the flannels – patch pocket blazer look in real life. As far as mainstream formal wear ‘trends’ go, TV seems to have a big influence. So a few years ago everyone was wearing tie bars and pocket squares a la Don Draper. Whereas more recently, Peaky Blinders seems to have got everyone all excited about three piece suits and tweed baker’s boy caps. Mr Crompton’s commentary about the existence of fashions even within the rather rarefied sub-culture of classic tailoring enthusiasts is certainly true and he offers many examples to back it up. I suppose one way to look at it is that there is a range of features / proportions / fabrics / fits that are *objectively* harmonious (for instant lapel width and gorge height) and the style cognoscenti DO vary with fashion but *within* those boundaries, while fashion victims and the people who sell to them have no such compunction. The graph, by the way, is quite interesting. 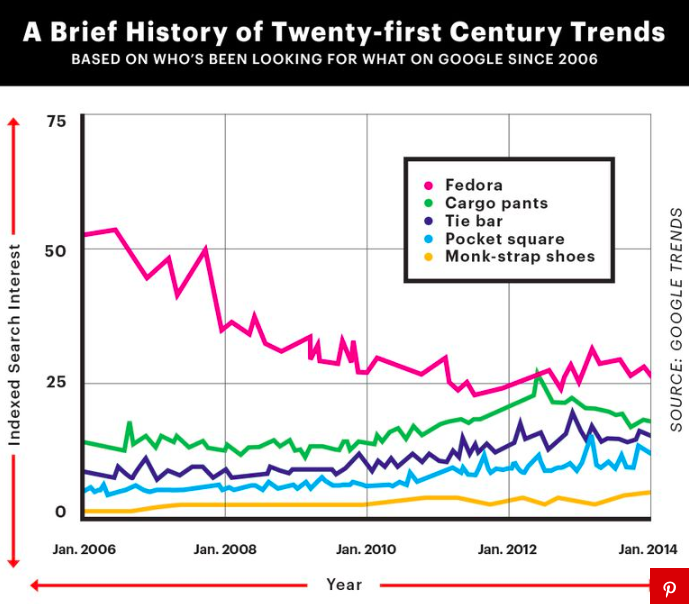 Cargo trousers trending down (yay) and felt hats (‘fedoras) gradually rebounding. Hi Simon, there is a certain amount of introspection in a post like this. Many of the most stylish men I meet are not (perish the thought!) followers of PS and have never heard of Pitti. They are simply men who take an interest in the clothing styles of previous generations that are delivered by their chosen tailors, shirt and shoe makers. Their suits, which often look a few years old, transcend lapel heights and sizes and their shirts are made to best suit their shape. A man in a navy or charcoal grey SB suit, a pale blue or white shirt, navy tie and a pair of well-fitted and polished black English oxfords will demonstrate the premise of ‘permanent style’ without consideration of on the minutiae – and will look much less ‘affected’ because of it! Trends are not that absolute: in the early 2000s, you had Heidi Slimane narrow cut & lapel but (thank god) you also had Gucci offering (very) wide lapels under TF. At this time, fashion was good and I did shop both at Gucci D&G which I never thought could happen and I would certainly not do it today. Fashion has its high and lows, across time. I agree that moderation is key. That’s why I have bought so few ready-to-wear clothes in the past few years. It’s rare to find moderate styles off the pegs today, at least not at prices below MTM. I have in mind exactly what I want to wear, and it has changed little with changing fashion trends. But what I want to wear is inspired by certain fashion trends of the 1940s – 1960s. When I see men in their short, low-rise, skin-tight stretch suits and tan oxfords without socks, I just want to run as far away from that as possible! Double-breasted suits and no socks? Hello Simon, this post relates to the post of Ricky and is in relation to local tailors. I know that you have said for years that local UK tailors are not covered on the site because they add very little to the value of the site in terms of design. We don’t have a “Leeds” jacket unlike Naples or Rome. Quite why that might be is probably down to history, but whatever the reason we don’t have it. All that local tailors can bring is a cheaper product and perhaps that product does not match up to London standards. Broadly I agree with both these points but there is always the exception that proves the rule and I think Ricky mentions the exception. I am now entering my last year of work, and because I work in a slightly old fashion organisation I am being “dinned out” in the major offices. Just before Christmas I was in Madrid and in the evening we had a black tie dinner – which in itself is unusual. It was lovely to see twenty people in dinner jackets and after reading your blog I was able to tell why people looked good (hand finished buttonholes, padded lapels etc.) not just that they had a nice suit on. Now this is the thing; it quickly became apparent that a good seven of us – six of whom were Spanish, all went to the same tailor for our dinner suits. I think we looked the best dressed in the room – but I admit to bias. All seven of us had been trained in the British Army and all seven of us, being unable to afford G&H had been introduced to G D Goldings of St Albans who made (certainly mine) service dress and mess dress. They were superb and indeed Goldings still hold a Royal Warrant for Tailoring. When the time came for me to buy another sort of uniform I obviously went to Goldings, and while for business suits I have moved away to other tailors I still wear the dinner jacket they made for me and if I ever did need to buy a set of tails they would be my first port of call. The thing is the other six Spanish gentlemen had done exactly the same and because of that there is a small but interesting group of individuals in Madrid who are exceptionally well dressed by a provincial tailor. Goldings of course are not the only one who has amassed such a following; there are probably five of six provincial tailors who have built up a worldwide reputation through supplying the armed forces and companies like Ede and Ravenscroft have done the same thing from supplying the legal profession and Billings from supplying Eton and I am sure there are more. I suppose my point is, even though Britain isn’t the power it once was, its “soft power” is stronger than ever. I would suggest that soft power includes the groups that school, train and live together for however long that may be and into that mix will come some local tailors who have a worldwide base of clients – and rightly so. Please don’t take this the wrong way but it is a little lazy to suggest that all local tailors don’t have an international reputation or can’t bring anything to the game. I think they can, you just have to hunt for them – like you have hunted for tailors in Naples, Milan, Paris and before that Hong Kong. Goldings is not a cheap option; they are approaching £3,000 for a dinner jacket but for that you get a wonderfully cut suit, hand made, that will last a lifetime. And of course if you are ever in Madrid you will probably get approving looks from at least half a dozen locals! Thank you John, that’s really interesting. Would you say that Goldings offers anything it is possible to highlight, as regards tails for example, that a tailor in London would not? Just to address the point of offering something different outside the city. I think you miss the point when it comes to tailors in the provinces. There are many, long established, who have full order books and who have at some point or another done their time learning classic Row skills. They don’t do anything different from the Row tailors, and from that point of view there is nothing that sets them apart. Except what they charge. They offer the same cloth and trimmings, and make to the same standard, but their prices are typically a lot lower. The Row today is in the £4.0-£4.8k range. There are many provincial tailors who will cut you a suit that is every bit as good for around £3.0. Isn’t that a sufficient point of difference for you Simon? I have mentioned that point in previous discussions – that they are differentiated only on price. However, you have to consider the relevance to the readership, 65% of which isn’t even in the UK, let alone outside London. Row tailors are much more accessible to most people, given the number of people that travel to London, and of course those tailors also travel to New York and around the US as well as elsewhere. Plus in London you can get excellent cheaper tailoring, from the likes of Steven Hitchcock perhaps, down to Whitcomb & Shaftesbury. I have to disagree with your comment about ‘Row tailors are much more accessible, given the number of people’ who travel to London. I cite as evidence the number of overseas visitors travelling to Bicester Village daily in search of affordable quality. Similarly, if you have ever visited C&J’s/Tricker’s/Lobbs’ factory shops in Northampton you would rethink that opinion. I have visited pretty much every factory shop in Northampton, and indeed been to Bicester many times. But far more people are in London. Dont bother with Goldings of St Albans, they have an online self measurement service…. that just about says it all. I can understand how the choice of cloth is dictated by fashion. You see someone sporting a nice cream linen suit today, tomorrow you call up your tailor asking for the same thing. But lapel width, I find, is more about proportions and personal build, like others suggested. A classic case of disgusery, I guess? Absolutely Ed. Though do you not think, that if that style of lapel were for some reason strongly associated with a very dated fashion, you would be less inclined to puck it? Yes, I guess that depends on how dated the style is! It is difficult for me to appreciate how the man in the top photo is demonstrating any sort of style. His colours seem odd and his tucked-in tie looks awful. Agree. It looks like out of date tailor garments put together without much coherence. But maybe that is just me. Really wierd comments! The jacket is a DB. What’s wrong with that? It’s a pic taken casually. He doesn’t seem to pretend preening for a pic aimed at covering the front page of a fashion magazine! The colors? Simply classic! Dear Simon, thank you for posting my very long response regarding provincial tailors. I do apologise to all non UK readers for re-opening this perenial topic which probably means more to UK readers than others. To respond to Simon’s questions and other points made if I may. I should point out I have no recent knowledge of this tailor and would not have mentioned him other than my pre-Christmas dinner. The next thing to say is that I really don’t think price alone can justify a tailors placing on Permanent Style. To my mind the quality of the work has to come first, followed by the overall experience and then the design. I would imagine Simon and most of his readers would put design higher but I would guess I am considerably older than most readers. Simon asked about a tailcoat which I explained I do not own because I only need one once a year. If I ever did need one I would motor up to St Albans because people I have seen wearing them look superb. In tails like little other clothing tradition is the key; I believe they place lead fishing weights in the tails themselves to make them hang better and all of the coats I have seen had a little pocket at the top of the tails where you could place your evening gloves – but I suppose all London tailors do this. So what makes them different? Well, if you want a traditionally cut English suit that is really well made I would consider them before several other tailors such as G&B (where I have had a suit made- which was very good) and W&S (where I have only seen pictures and Simons comments). This site is not called todays designs but permanent style and I think its wrong to discount provincial tailors who deliver a high quality product (albeit of a traditional design) whose workis as good, perhaps better, than some tailors who have appeared on this site. The other point I was trying to make was even simpler – some provincial tailors have a wider reach internationally than might be imagined. I would not be surprised if their were an equal amount of Giddings suits in Oman say than A&S. And it isn’t just Giddings but a whole group of tailors based in Camberley, Portsmouth, probably Hereford – though the SAS isn’t the smartest groupof soldiers, Harrow and the British equivelant of “Ivy League” places of learning. 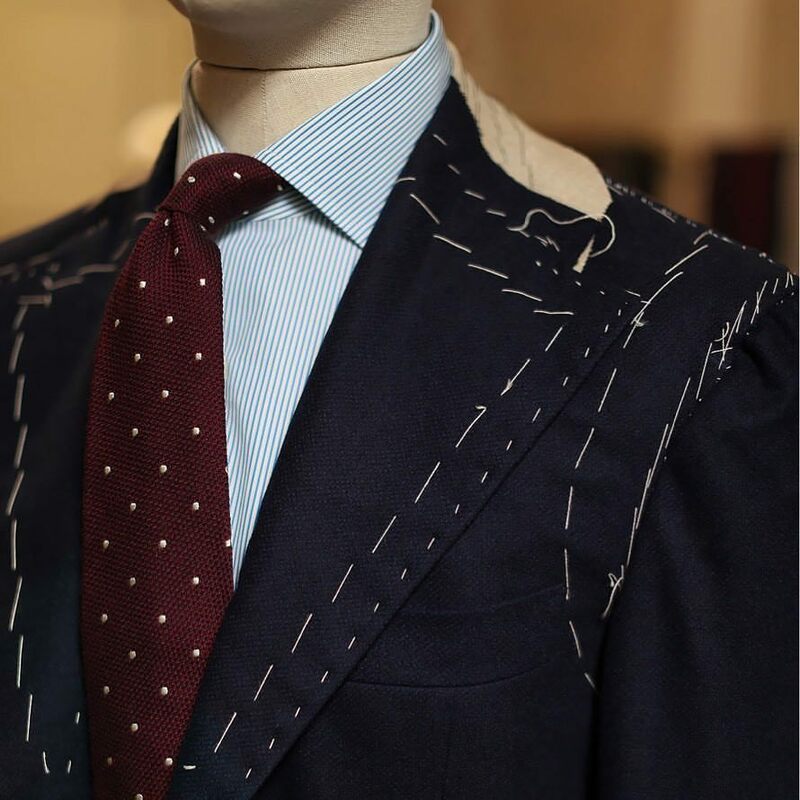 I really think that an interesting article could be constructed on these traditional provincial tailors who in their own way are as important as provincial tailors in Milan and Naples and like them are keeping the craft of bespoke going. Distilled to its essence, the colour, fit, detailing, etc. of clothing, or what we term “style”, is simply to evoke a emotional reaction in both the user and people who he comes into contact with. I think we have long ago established the ideal way to flatter a man, with minor variations to account for body shape, and such. But it’s the eternal desire to stand out from the crowd that leads to deviations of this ideal, often resulting in subtlety falling by the wayside. Well, that’s my introspective view at least. Apologies if this is slightly off topic, but I’m hoping to take a opportunity to get your opinion. I’ve recently commissioned a sports jacket in brown cashmere/linen with the intention to wear it in semi formal conferences, as well as with jeans and knitwear on holiday. Would you feel there is a huge difference in the look of here patch pockets versus a jetted breast pocket plus two patch pockets? I noticed your Elia Caliendo jacket has 3 but you commissioned a few casual jackets with 2 patch pockets. Was this a deliberate choice? Please excuse the language barrier Simon, but did you mean that the presence of the hip patch pockets themselves makes a huge difference in the informality of the jacket (and therefore a patch breast pocket adds little in terms of informality), or the details of the hip pockets make a greater difference (eg. size, shape, etc). What made you decide to have 3 patch pockets in some jackets but 2 in others? The former – the hip pockets make more of a difference than the breast pocket. I’ve had patch breast pockets only occasionally, when I particularly liked the shape of that tailor’s pocket and wanted to see what it would be like. I am deeply upset to read that Tobacco Linen has had it’s day. I was just about to commission one. It seemed the perfect colour to me; it isn’t navy, grey doesn’t suit me, cream is too impractical. Sorry – brain freeze in this awful weather! I intended to type Goldings not Giddings. I too went onto their website to check out the latest prices and found I had overestimated their price; a DJ costs £2,800 which I assume includes VAT. Interestingly the prices have remained quite stable over the last decade. I too noted they now offer an online service where you measure yourself and am really surprised by this, however all I can say is the quality of the product I have purchased in the past has been every bit as good as many mentioned on this site. I believe if you want a traditional made, traditional English cut suit that you could do little better than motor up to St Albans. Also we have to be a little careful on how we word responses on this site; just because a photograph shows an individual with a sense of style we might not like I don’t think he should be lambasted. At least he is showing style and not wearing jeans and open shirt. Likewise you can’t have your cake and eat it regarding provincial tailors who offer a MTM service from clients own measurements. At least they are trying to broaden their appeal and geographic base. Would I take the option – of course not and neither would most readers of this site. But if you didn’t travel then this is a way of producing something that would be most acceptable to a number of people whose only experience of suiting was going to the high street; I can certainly see it being less intimadating than walking in off the Row for the first time – something I remember well! The welcome was very warm but walking up the steps and opening the door not knowing what to expect is quite a thing to do. I live in the sticks and have often used tailors from outside London. I have one Saville Row suit from A&S, and it isn’t as good as any of the others. The best buttonholes I have ever seen were formed in Leeds. I totally agree with John. I think you need to open up on this one Simon. The price difference will get you an overcoat. Thanks Toby. I’m happy to cover them at some point, but it’s not going to be a priority – no one has really disagreed with my points that they are less relevant to most readers, and don’t offer much more than price. I’m sure the quality is high, but it’s not quality you couldn’t get on the Row also. But that is exactly my point! Of course you can get that quality on the Row, but it will cost you ££££s more! Thanks Toby, but I have always accepted that point – in the discussions above in the post, and in all previous posts. But there are also options on the Row like Whitcomb & Shaftesbury and others that are cheaper. And as I have said, I don’t think price alone is enough to justify covering people, when they are less accessible to the vast majority of readers. 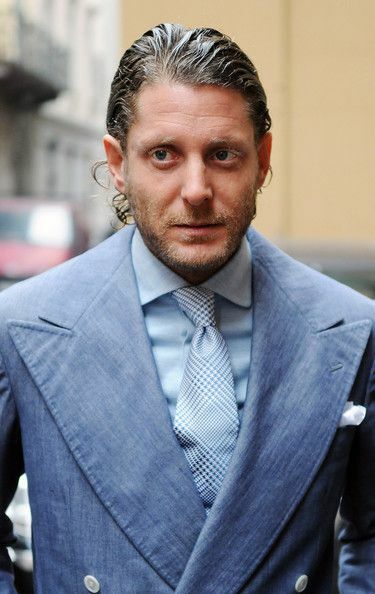 On that basis you would only ever cover one tailor in Naples, Rome etc but I recall many visits to Italy. Is it because the provincial tailors mentioned do not have sufficient funds to market themselves? No, as also mentioned above, there are many distinct styles in Italy but not really in the UK. Also, pretty much all of those Italian tailors travel – some to London and the US, where the majority of the readership, some around the rest of the world. So the tailors in Naples have many different styles but all the provincial tailors in the UK have the same style. That seems like quite a generalisation. If I recall correctly some of the more well known provincial UK tailors travel to London and US cities too. As stated, happy to hear suggestions of ways the provincial UK tailors vary in styles, and of ones that travel and are therefore more relevant. Have you started to actively censor contributions to your forum? I have sent you three notes pointing out that you are wrong to refer to Steve Hitchcock as one of the “cheaper” London tailors, thus misleading your less knowledgable readers. Steve is actually amongst the most expensive, and in my view one of the very best on the Row, judging by the garments he has made me over the years. It would be reasonable to advise your readers. I have always actively managed comments on the site. It’s one of the things that readers often highlight as a benefit, as opposed to forums that become personal, abusive, or simply digress. I go through a lot of these every day, but from what I remember one or two of those comments were a little abusive so I didn’t publish them. Thanks for the update on Steven’s prices – the last time I used him he was slightly cheaper, but clearly this has changed. Do let me know the current pricing if you have it. Steve starts at £4.2k for his standard two piece, and then up it goes based on cloth. “double monks seem to have had their day”… Amen. The epitome of bad taste. Still on the theme of body shape driving choices rather than fashion. In addition to the obvious link between lapel width and shoulders, body shape should drive trousers. I have thighs which are large relative to the rest of my body. As a result I have my trousers made large around the thigh. The rest of the leg I also have made a little wide, if not they would like a leg of mutton. Pleats also help. Hello Simon, building on the robust discussion on tailors outside of London. Why do you suppose there is such a diversity of styles in Italy, whereas in the UK they are so similar? I don’t know enough about the history in the different nations to say for sure, but a big influence is definitely the way London has dominated the UK as its political, economic and cultural centre. You see the same with Paris in France. Italy, by contrast, has very distinct regions with different cultures, and of course was only unified relatively recently. I suspect Germany would be similar if it had had the same history of menswear, craft and fashion over the past 100 years. Great range of comments though the article was a little short in depth. As a matter of feedback it is clear that you remain an expert in the area of tailoring but when wandering into the subject of fashion I often find this – I think perhaps this is based on the fact that you may not recognize some of the trends as they are now aimed very much at a different, more budget focussed, youth market. Also, even at the high end, that market is driven by advertising and brand identfication rather than buyer experience or the pursuit of tailoring excellence. With designer brands product has changed markedly. Up to 2008 major brands continued with quality tailoring but post 2010 many moved to a more casual ‘urban’ sensibility (this was most evident in HN and Self. over the last decade) – the current tend of athleisure is certainly a reflection of this. Separately, the subject of regional tailoring has again arisen. It raises two points; firstly I think it needs to be accepted that UK men, particularly those over 30 – 35 have different expectations to Italian men – they like and expect structure – lack of it to many equals a sense of sloppiness. The regional tailors therefore answer this requirement. Secondly, you have travelled Simon and have broadened your outlook and sensibilities but you dismiss the home market outside of London without really thinking why it functions the way it does. If the market demanded something different it would, in time, alter the offering. To assume that it can’t misses the point. I stand with many long term readers who feel that this point is not just one of fairness but of accuracy. I raised this particular point with a regional tailor last week. Whilst he had a more casual RTW offering (technical fabrics, unlined jackets with sharp, modern silhuoettes etc.) his bespoke clientelle continued to seek a more traditional form of tailoring – to his customers he was therefore offering the best of both worlds. Lastly another anonymous raises your ‘censoring’ of comments, I have found the same – there is never any abuse but I do disagree with you occassionally, particularly on matters of exactitude. I find that you censor comments when a robust counter argument (with supporting facts) is sometimes put. It would be a pity to move away from the position of healthy, respectful exchanges – it has become a feature of the site. I completely agree that personal abuse is out of the question ( indeed I have defended you on occassions when comments are out of line) but having only a lobby of agreement or praise would weaken the site and remove the feedback and comments that help PS evolve. The piece is of course only about sartorial trends, in the bubble industry of crafted menswear, so I only looked to address those. On regional tailoring, you may well be right that older English men prefer more structure, but I certainly wouldn’t say it was all. Most men I know in London over that age do not prefer it. I guess in both cases it’s a question of people you know. I disagree rather on the point about the market adapting if it had to, though. You only have to look at the London tailors that have tried to adapt to softer tailoring and found it very difficult. There are many things that make such change difficult. Finally, I try never to censor comments and your comment here is both substantive and courteous. However, I frequently get emails and comments from other readers who ask that I am even stricter in not publishing any comments that are not useful. And of course there are tens of thousands of them for the few dozen who actively comment. It is for them that I restrict comments and the discussion, not for me. Simon, do you also consider the way suits are worn as part of fashion? I think ourdays most people, at least in an office Environment, so not button the suit up (like Chad in the picture above. Obviously a lot of the perks of a suit are being lost this way, but it looks more casual, less stiff. Is this something you’d talk about with your tailor and are their ways a tailor could take this into consideration (e.g. focus on a nice drape while the suit is unbottened)? This article reminds me of the Mighty Boosh’s “Call of the Yeti” episode: Vince subscribes to a magazine called “Cheekbone” which is so cutting edge it goes out of date every three hours. The magazine is also delivered by Ninjas. Vince is going camping and he considers whether to pack his Jacobian ruff but decides not to. He is then disappointed to see “Cheekbone” magazine declare that Jacobian ruffs are back in fashion. I was going to get my tailor to make a nice Tobacco linen jacket for summer, but now that I read that particular cloth was considered a fad … actually stuff it, I don’t think I’ve seen anyone wear a tobacco linen jacket in the wild so I’ll just go with my gut instinct and get it commissioned. “Fashions fade; style is eternal” – Yves Saint Laurent. While reading through the comments I was struck by how many of your readers are asking for a little more “UK outside of London” content. It occurred to me that perhaps you could occasionally visit a UK city and review what is available there, visiting the bespoke tailors, shirt makers and shoemakers, and, rather than commissioning something from them, looking at their work, talking with them about what their local market wants and giving your views on the quality of their work. You could also advise on where we could buy good accessories, and whether there are any shops that might approach the standard of, for example, Drakes. It would be useful for those of us living more that 60 miles from London to find out what is available within an hour of our own homes. and we promise that if you give us advance notice of your arrival, we will keep the dragons locked up. Thanks Thorn. I’ll certainly consider it. The issue is I would have to do 8-10 to do any decent coverage of the UK, and that would still only be relevant to a minority of the readership.